Paul Butler, right, addresses an audience of Detroit leaders, students and members of the area’s law community. As a Washington, D.C. prosecutor, Paul Butler started every case he tried with the same statement. Butler said he went into the prosecutor’s office as an ‘Undercover Brother’ – someone trying to change the system from within. 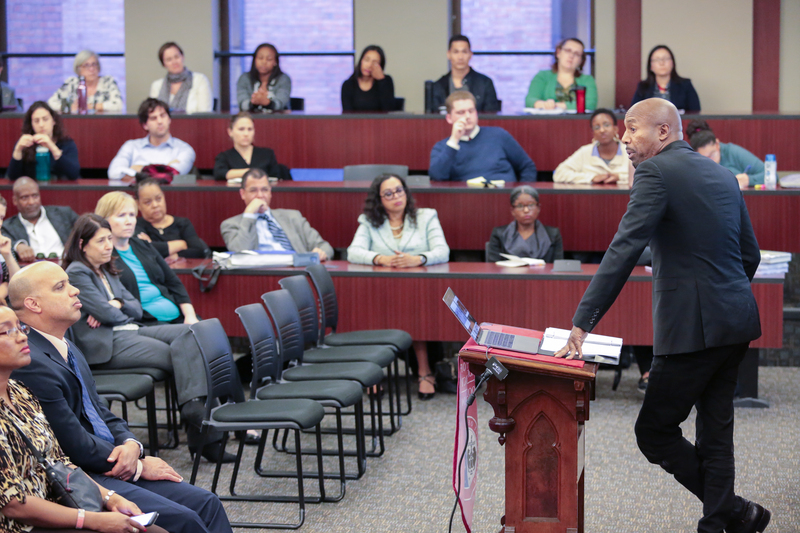 Butler, now a professor of law at Georgetown University, shared his experience and insight Oct. 22 at the inaugural Dewitt C. Holbrook Lecture on Social Justice at University of Detroit Mercy School of Law. Butler researches and teaches in the areas of criminal law, race relations law, and critical theory. His research has been published in many leading scholarly journals, including the Yale Law Journal, the Harvard Law Review, the Stanford Law Review, and the UCLA Law Review. Butler discussed his Jesuit education as a source of inspiration, saying, “I have always been inspired by the messages of leading by example, ‘men and women for others,’ and especially a commitment to social justice,” he said. The lessons he learned as prosecutor led him into academia as a researcher, and ultimately to the writing of his book, Chokehold, which last year was named a Notable Book by the Washington Post and among the best books of the year by Kirkus Reviews. In the book, Butler points out what he calls four thematic frames around discussions of black men and policing. The first, he said, is the cultural-behavioral model, which supposes that the problems begin with black men. The third frame — police and community relations — Butler sees as a more liberal-progressive one. “[It’s the belief that] we have to get to understand each other better, that we should better appreciate what’s going on with the other side for better relationships to develop,” he said. The fourth frame Butler shared from his book is one he called radical. Those who subscribe to it see the criminal-legal system as tools of white supremacy and social control. “Groups like the Movement for Black Lives say that, if we just work on the police you’re treating the symptom rather than the disease,” he said. Following his lecture, Butler took questions from the audience. A law student asked Butler when was his “Paul on the Road to Damascus” moment, when he came to see himself as part of the problem. There was not just one moment, Butler said, but he recalled his arrest for an unnamed offense, and his trial in the same courtroom where he worked as a prosecutor. Another attendee, a judge and ex-prosecutor, asked if Butler meant Black Americans shouldn’t represent themselves in the system. “I was a prosecutor and never felt the way you do,” the judge said. Butler said the issue must be addressed in a multitude of ways, and that changes won’t come from the inside. “It’s like joining the Army because you’re against the war,” he said. The DeWitt C. Holbrook Lecture on Social Justice, which will be held annually at Detroit Mercy Law, will provide prominent leaders in the legal profession a forum to address issues on law and policy related to social justice.